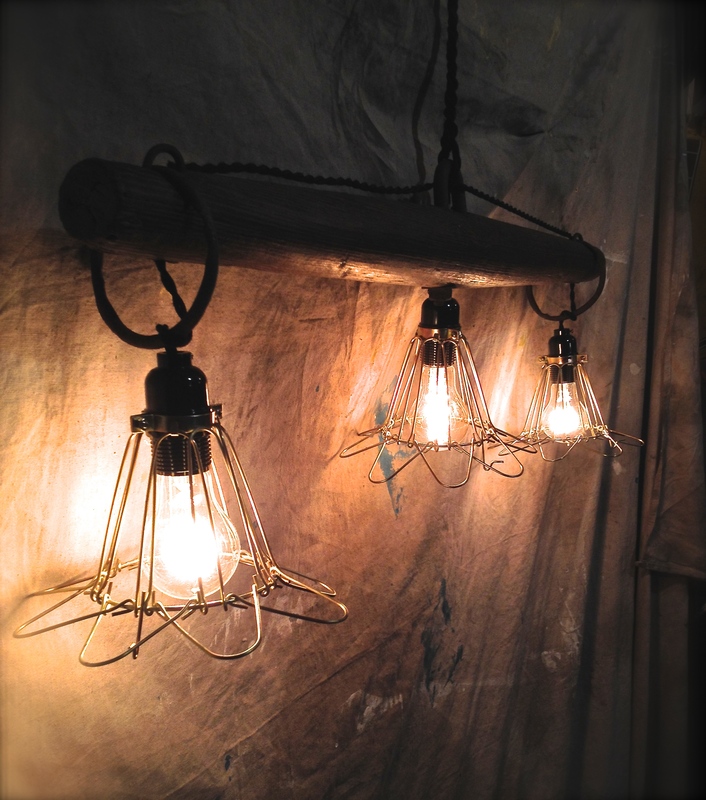 Rustic hanging light fixture made from and old plowing yoke. The upcycled weather beaten wooden farm implement serves as the centerpiece. 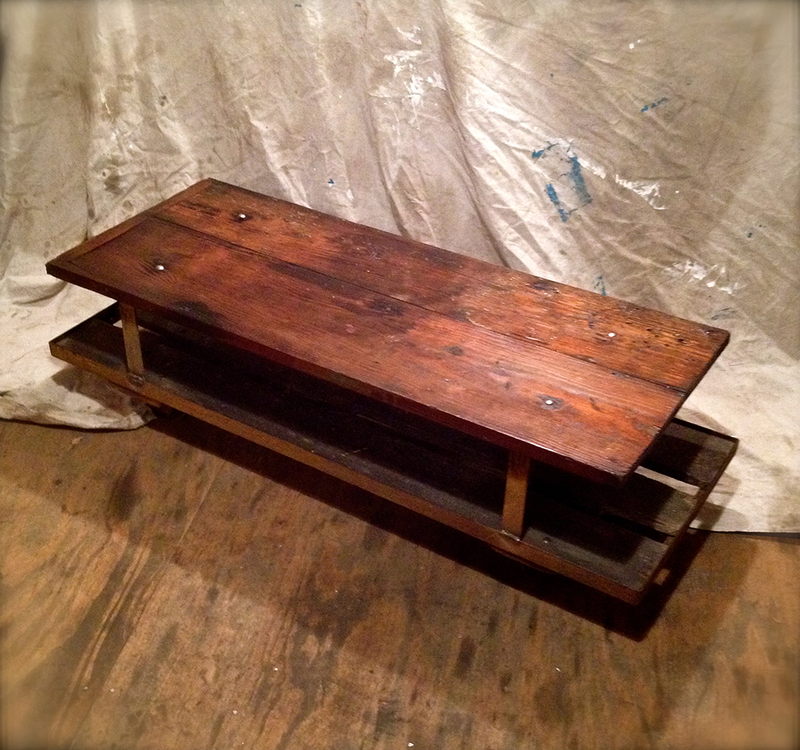 Well worn wood in original condition with original patina’d iron hardware. 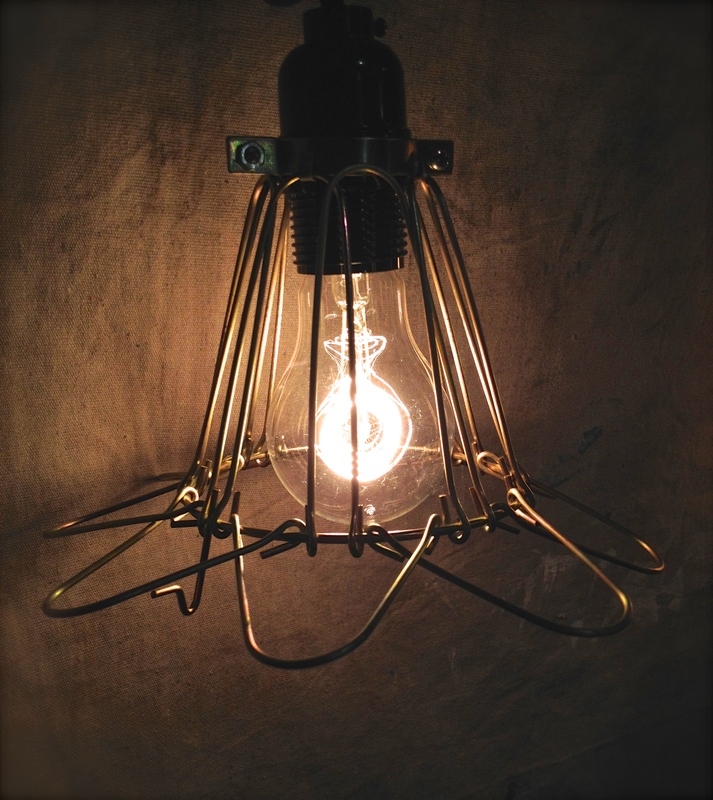 Pendant lights are vintage inspired brass cage lights. 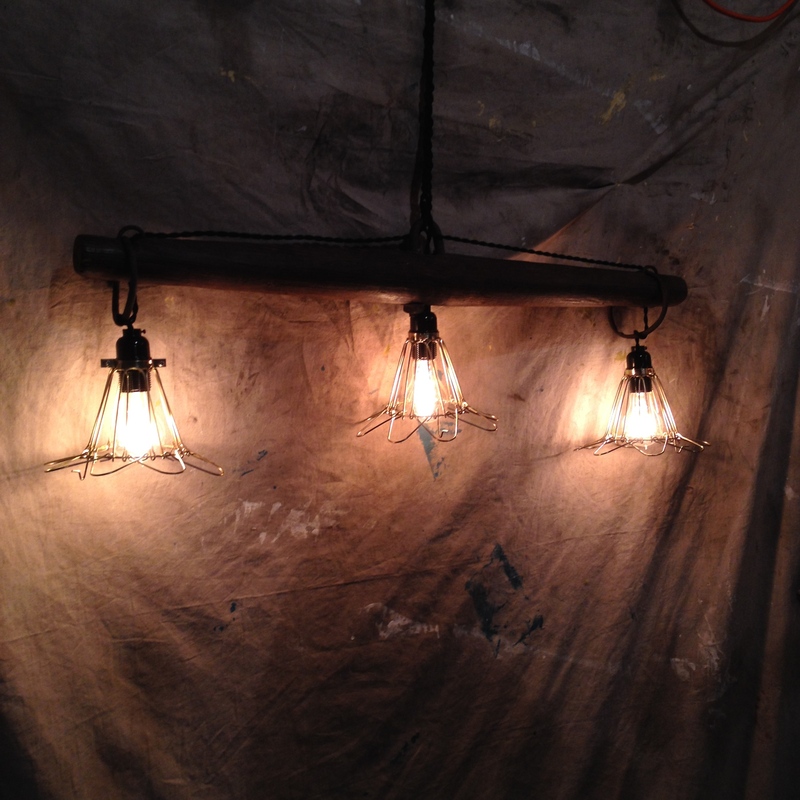 These are replicas of the old industrial work lights. The cages are hinged and can open or close to various positions. Lights are wired with new black sockets and black twisted cloth covered wire. 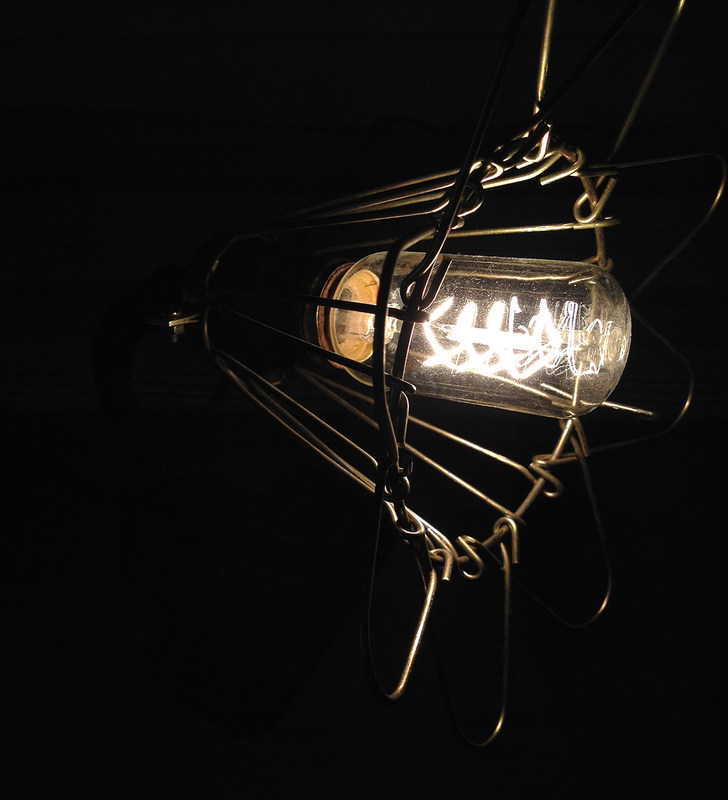 Vintage style quad filament, Victorian style bulbs are included. 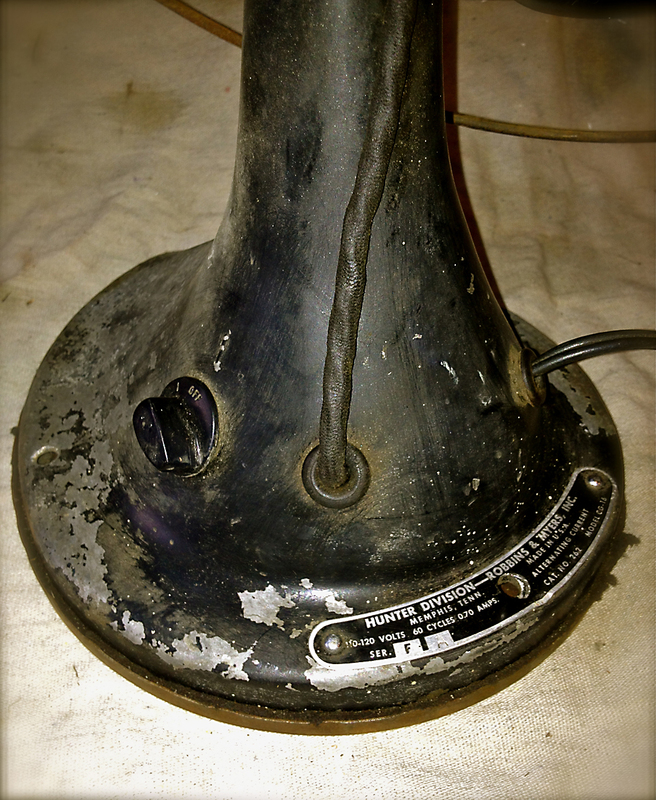 Vintage gooseneck desk lamp with a cast iron base, flexible neck, brass socket and industrial work light style adjustable cage. This is a very unique lamp. 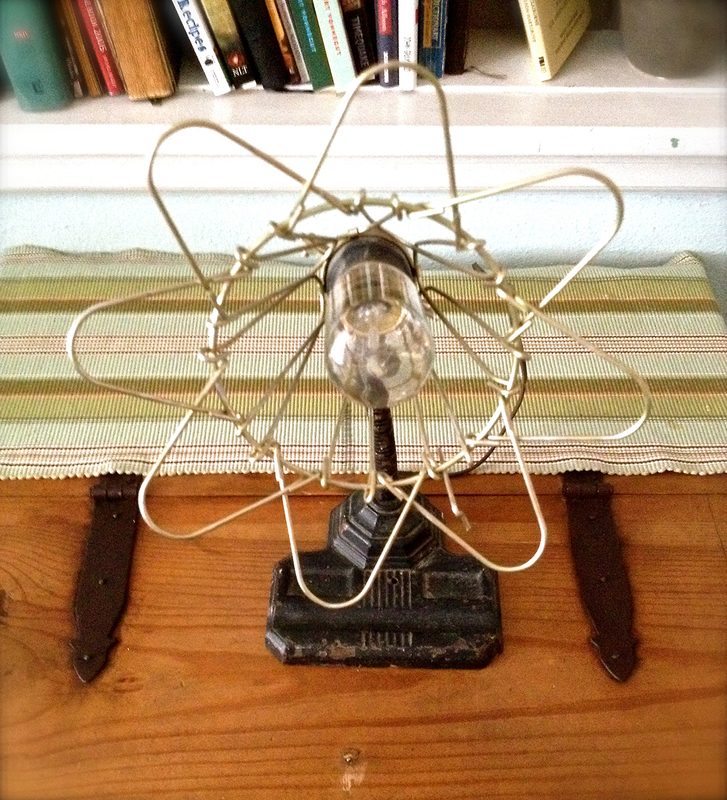 Art Deco in style, but combines machine age simplicity with the addition of the work light cage. 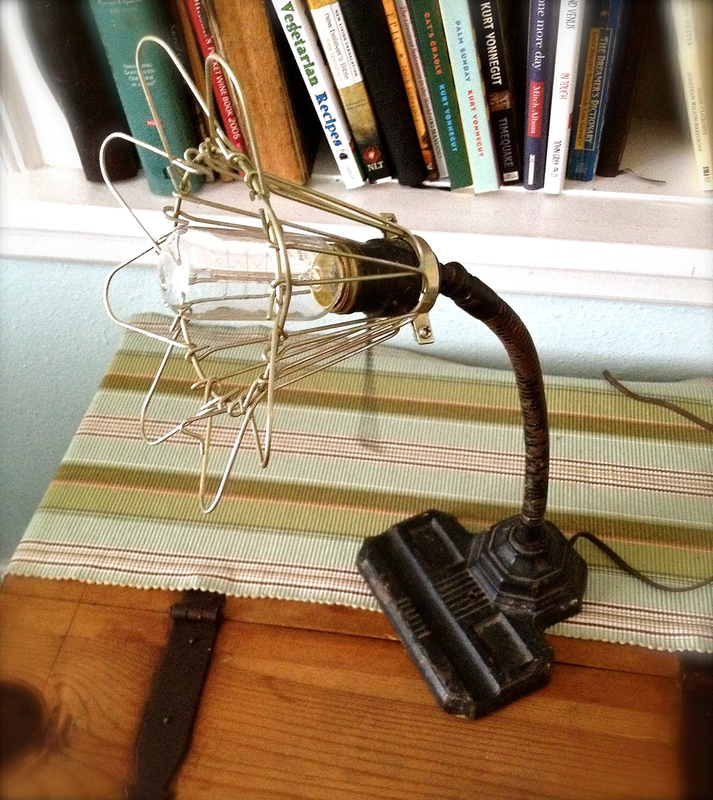 40 watt Radio style vintage bulb is included, but accepts any standard base bulb. Makes a nice statement piece for your desk at home or the office. 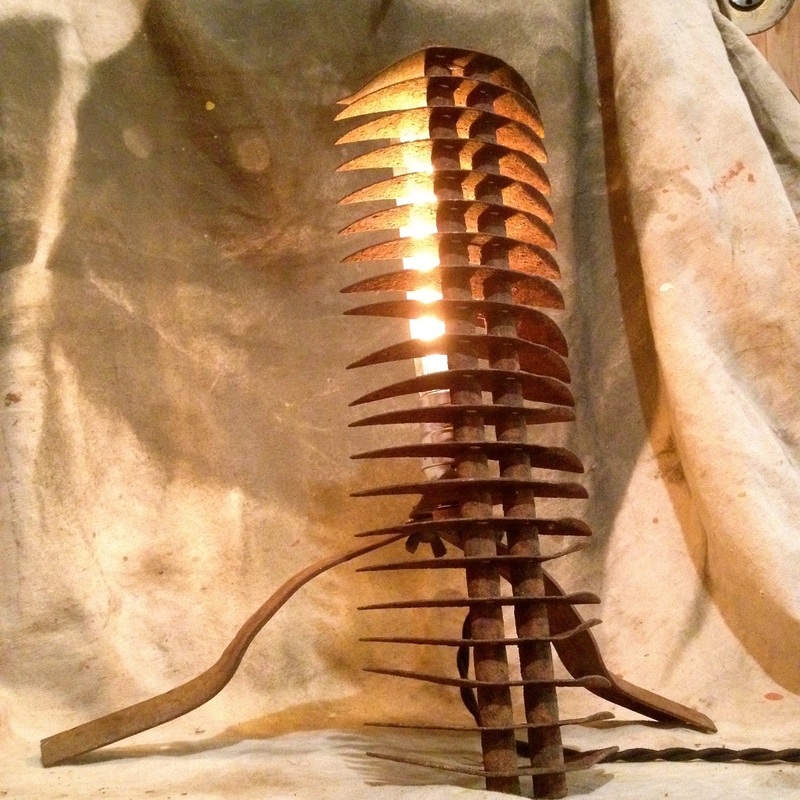 This unique table lamp is made from an old upcycled thick metal blade yard rack. While nothing historically, significant, this piece has been around for at least 30 years out at my parent’s property. I remember using it as a kid…I recently found it rusting away in the weeds out by the woods. 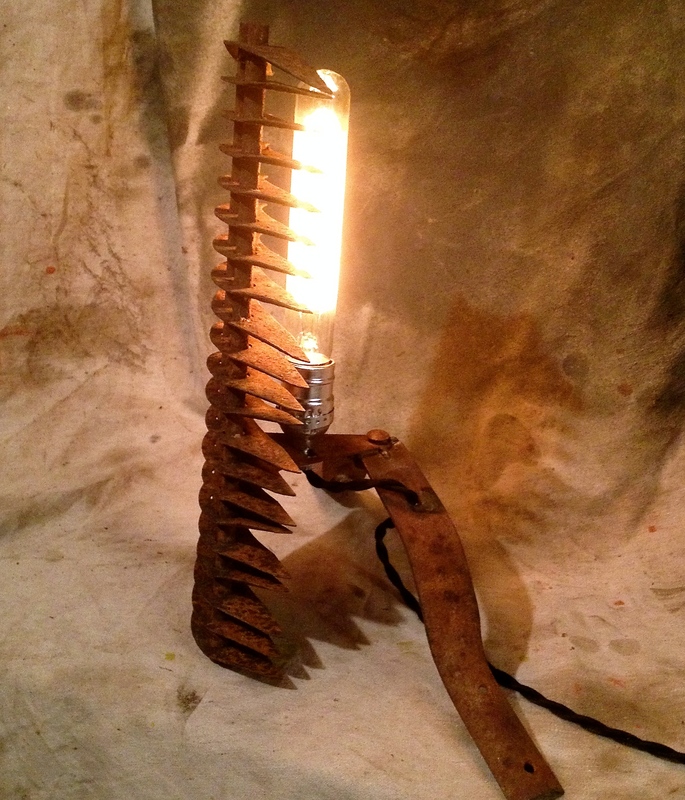 It has such as cool look and design, I thought it would be the perfect candidate to upcycle into a cool decorative lamp. The finned blades are all fairly heavy steel with a nice rusty patina finish. The wooden handle and rotted away long ago, so I cut off the attachments and used those as legs to stabilize the piece so it stands vertically. Has a nice rustic, industrial and almost art deco inspired appeal. It was then wired up using some vintage reproduction black twisted cloth covered wire with an inline switch and vintage style plug. 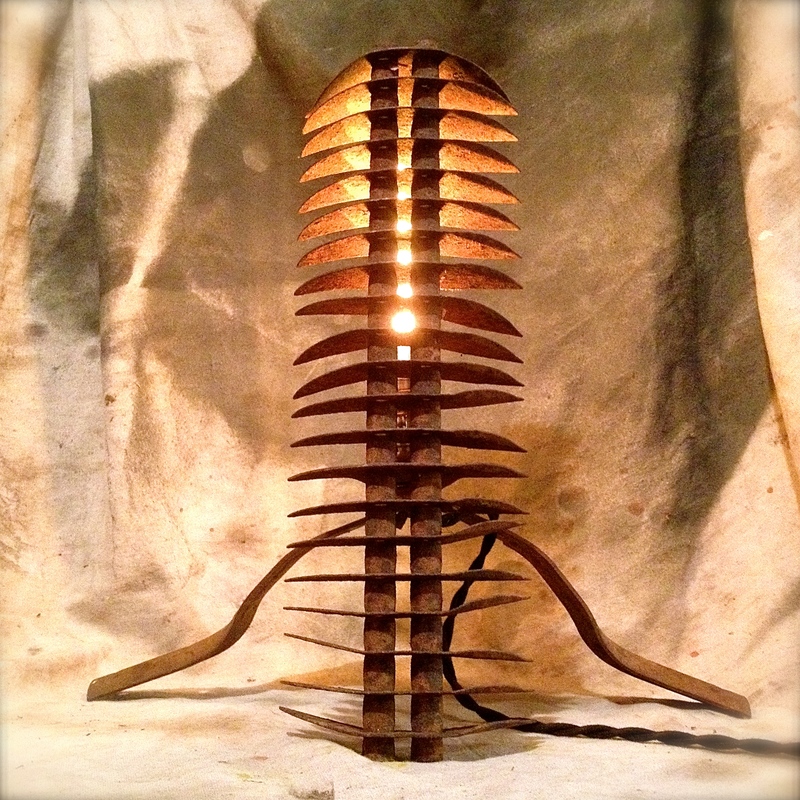 It uses a vintage tube style 30 watt bulb which fits the vertical style of the light and puts out a nice warm glow. Should you require more light, you can replace with any standard base bulb. 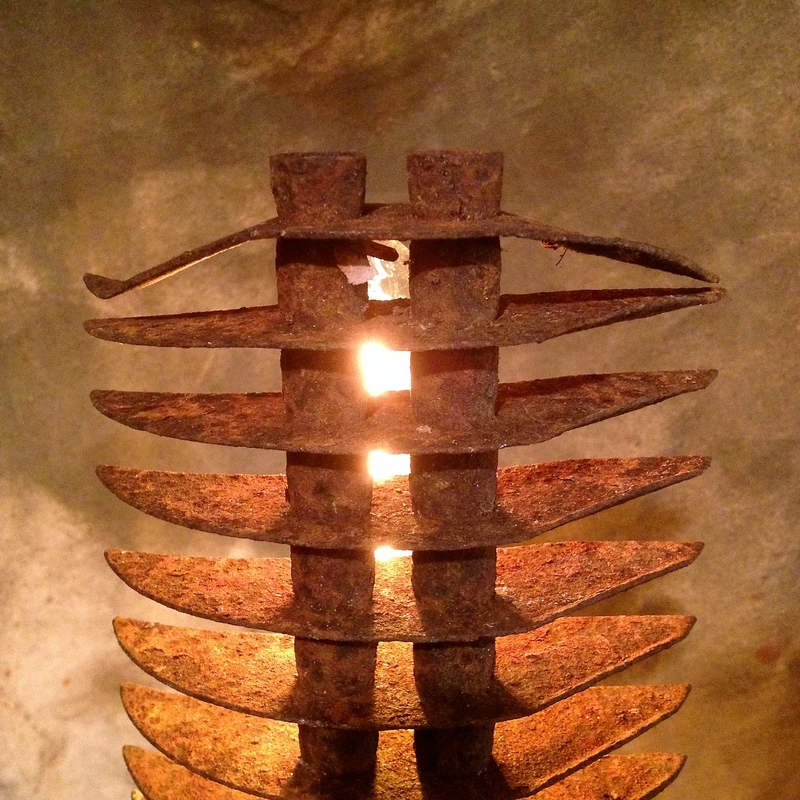 Very cool piece and makes a great addition to your farmhouse, cottage, living room or office. My buddy at HDRA pointed this out to me. 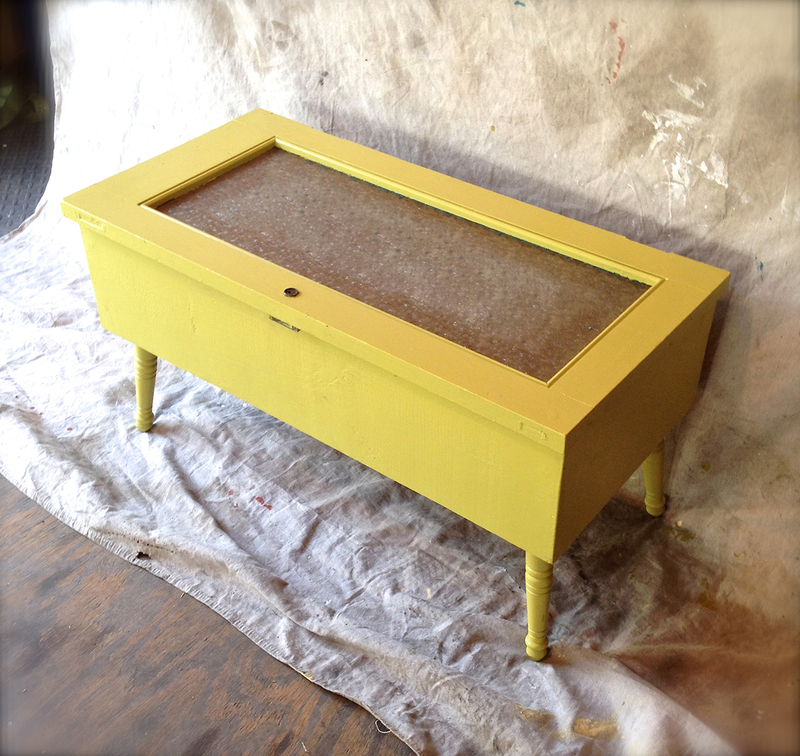 Shabby Chic / Mod style coffee table made from a vintage 40s-50s cabinet door. 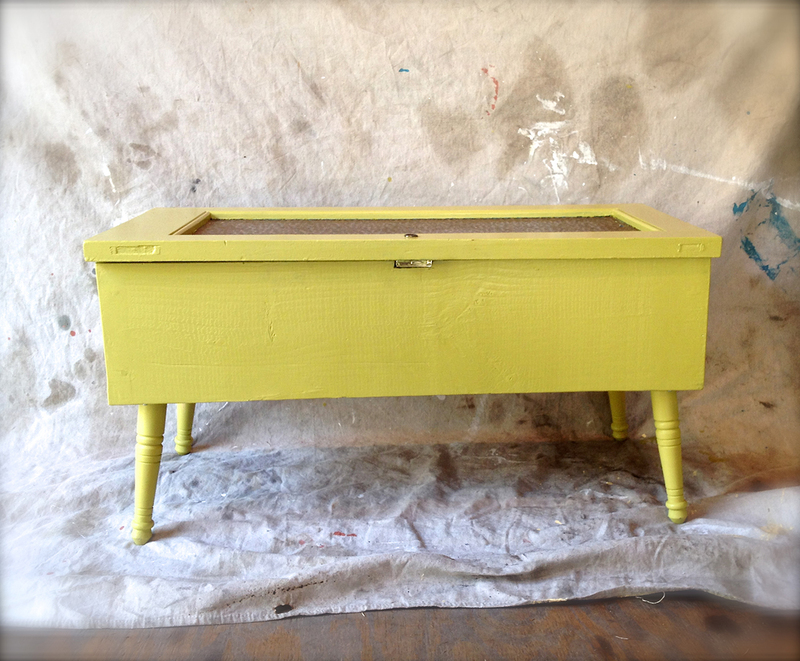 This table is based on the same design as our reclaimed window coffee tables. 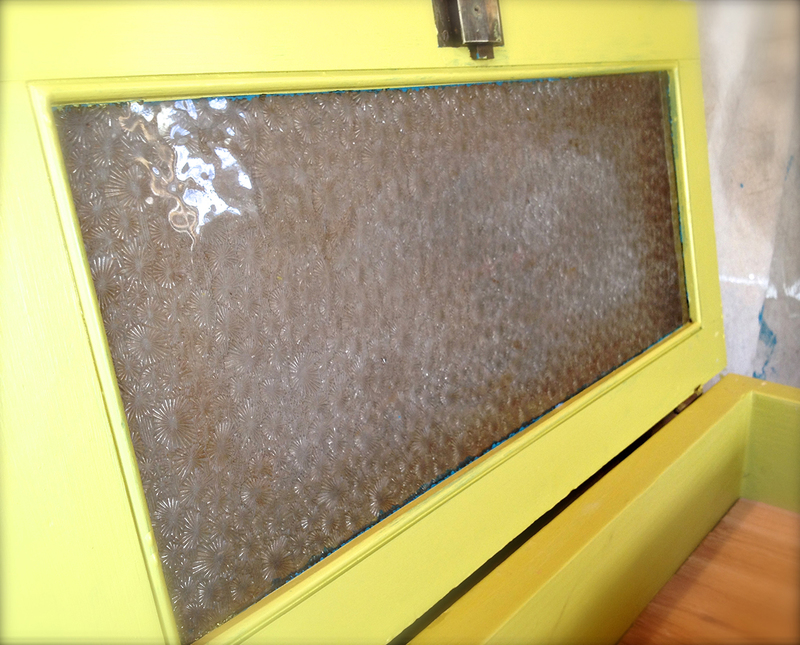 The table top is a vintage cabinet door from the 40s-50s. Complete with original brass hardware, lock (non-functioning) and real brass hinges. The glass is very cool textured frosted glass. Tables base is built from solid 2″x8″ pine boards and very heavy in construction. Interior shelf is made of 1″ x 4″ rough cut cedar planks which alternate and vary in their natural color. 7″ early American style legs were used thread into the base. Also removable should you want to change the style, height or even convert the table into a cabinet. 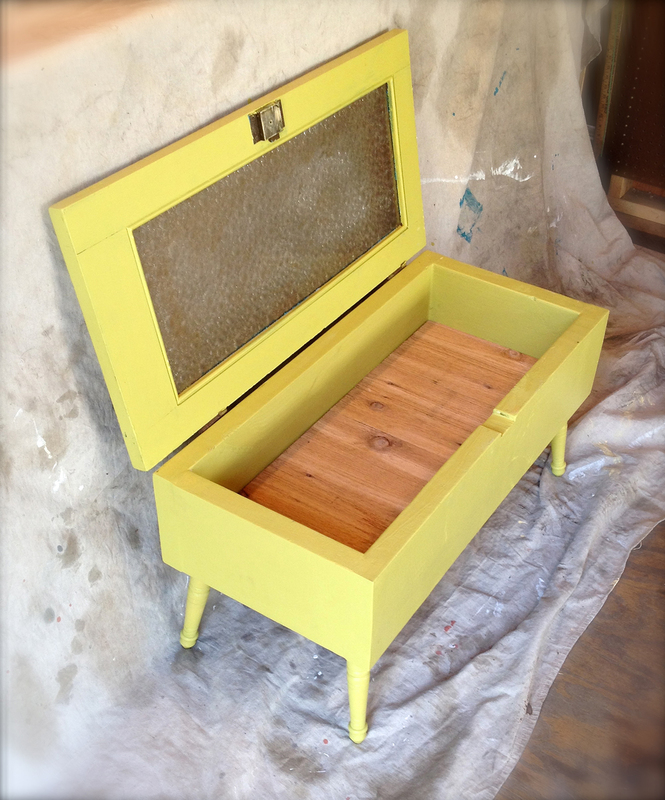 Finish is a chartreuse semi gloss. Minus the door, all wood is new. It’s been quite a while since we’ve made any new posts here, or on our facebook page. Working a 40 plus hour a week day job and balancing this business on the side can be overwhelming sometimes. We’ve been super busy trying to fill orders for coffee tables and some of our lights that there hasn’t been enough hours in the day to get out picking, work on new projects, etc. So I took some time last weekend to make a little sculpture thing for Jessica. It took some "inspiration" from my new bubbler from here. I found an old John Deere farm implement at a local farmer's market. Super heavy old steel. Some type of disc for plowing from what I can tell. 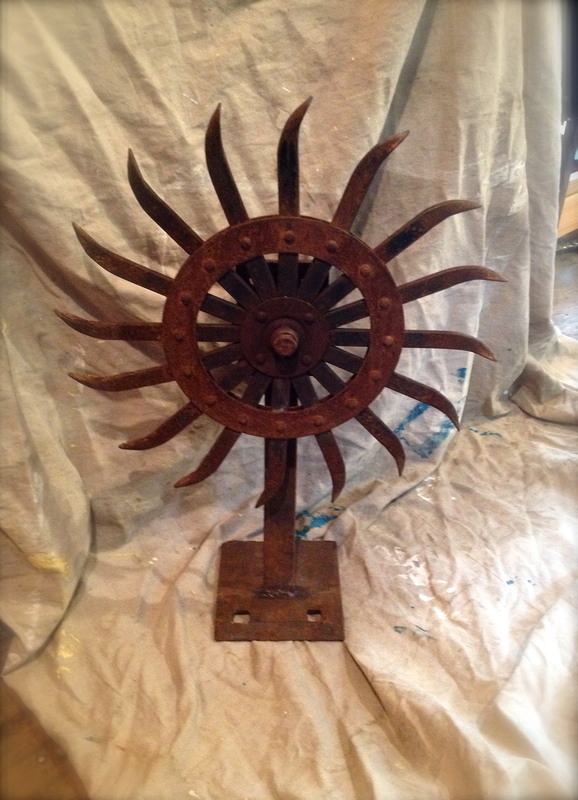 Used the existing bolts and hardware that came with it to make an axle of sorts, and welded up a stand out of some old rusty plate steel and one of the leafsprings I had laying around. Turned out pretty good I think. Currently NFS. Vintage Mid Century desk fan made by the Hunter Division of Robbins Myers. 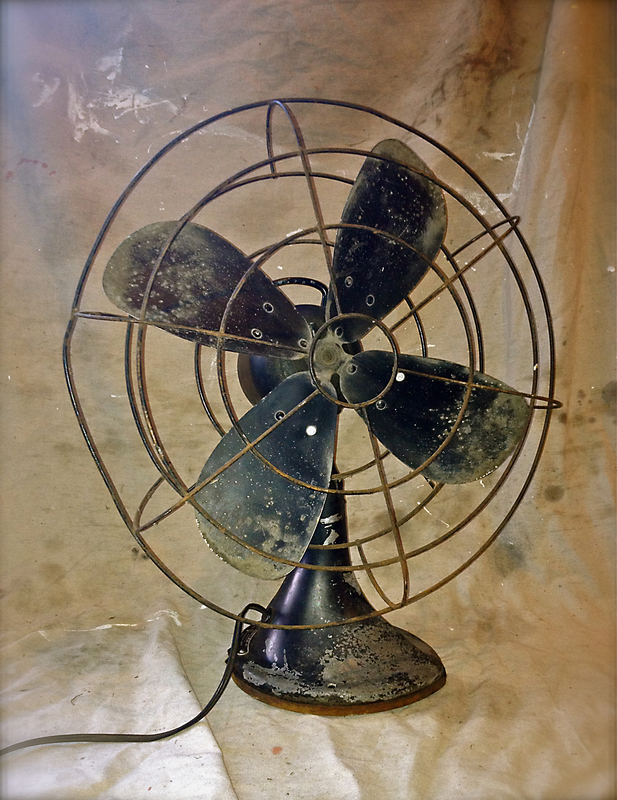 Very high quality vintage fan made In Memphis, Tennessee in the 1950s. This fan has large 16″ “pizza slice” blades. 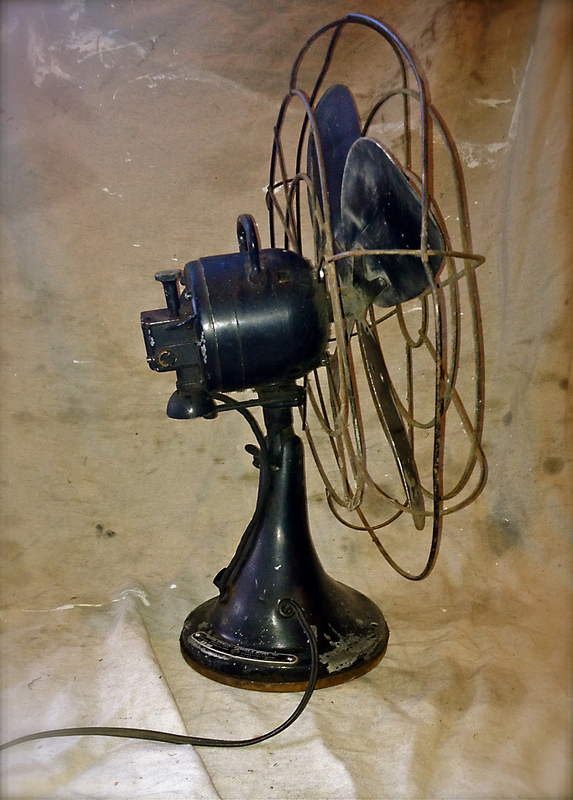 In original unrestored condition, black paint with nice patina. Please see all photos and realize this is an unrestored “barn find” and does have minor surface rust, chipping and patina. Special thanks to MCM League for their help finding this piece.